At the Drive-In mine technology-driven paranoia and dread in their new "Call Broken Arrow" video. Director Rob Shaw weaves stop-motion animation throughout the clip – a prequel to his visual for "Hostage Stamps," from the band's recent fourth LP,in•ter a•li•a. "Call Broken Arrow" follows the same disheveled prisoner and disturbing, faceless captors previously seen in "Hostage Stamps," with a cameo from street-swarming robot spiders. The new clip explores how the protagonist wound up in prison, though its shadowy shots of car-wiring, poisoning, surveillance photos and flaming corpses follow more of a dream logic than literal narrative. "In 'Hostage Stamps,' we have a prisoner being tortured and monitored by some sort of authoritarian organization. The guys wanted to show why he was imprisoned, as well as cast doubt over his innocence," Shaw said of the clip in a statement. "It's funny how in stories, especially film stories, you tend to sympathize with whoever you spend time with. When you watch someone being mistreated, the assumption is that person is the victim. 'Call Broken Arrow' is in part about illustrating the prisoner’s culpability, but even that is in doubt as we see the Watcher character who follows him around slipping something in his drink at the end." 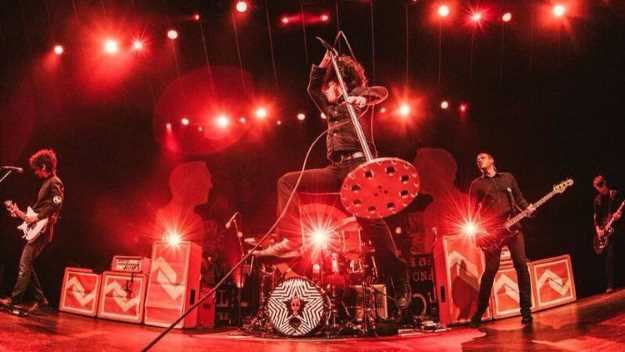 At the Drive-In are currently touring behind in•ter a•li•a, with intermittent dates booked throughout late November. The quintet will perform at Chicago's Riot Fest on September 16th. At the Drive-In blend stop-motion and digital animation with their unnerving "Call Broken Arrow" video.